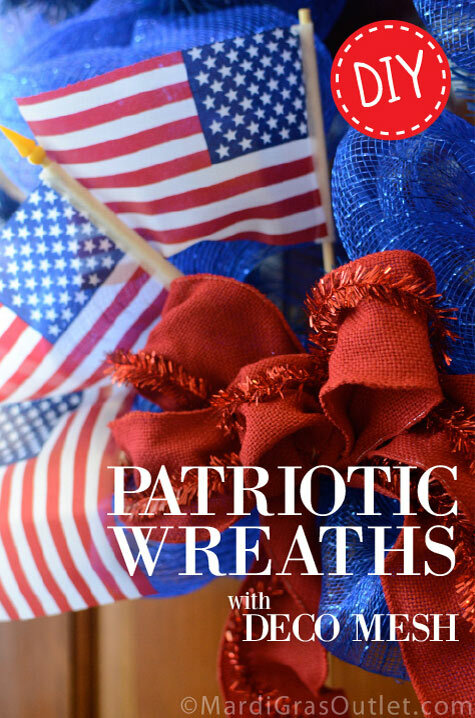 Let your colors fly for the Fourth of July with a patriotic themed wreath. 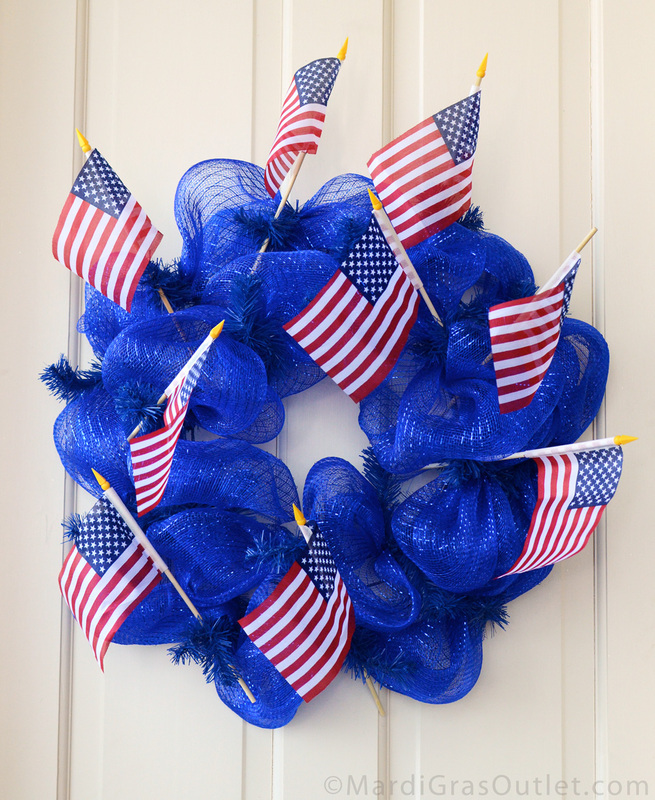 A basic blue deco mesh puff wreath is transformed from plain to patriotic by adding American flags, paper fans or festive beads. 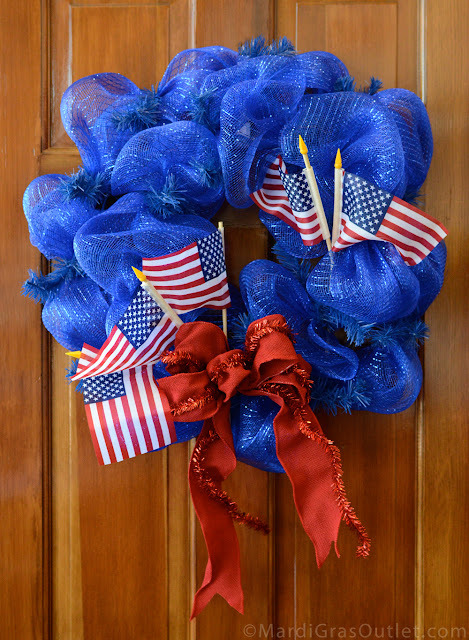 Here are some inspiring ideas. 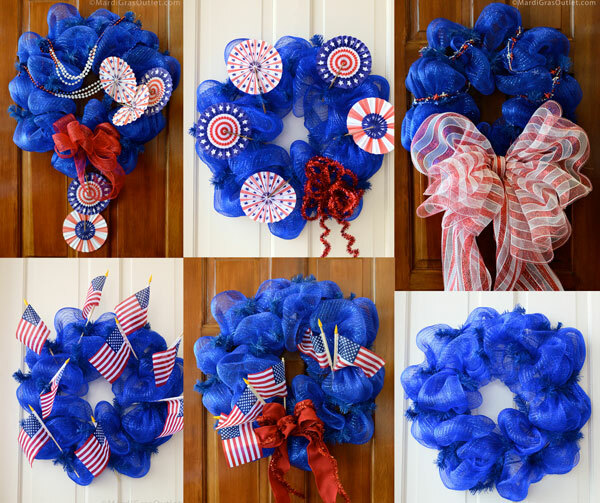 Keep scrolling down for more ideas and tutorials on creating the fun wreaths featured here. What is Deco Mesh? 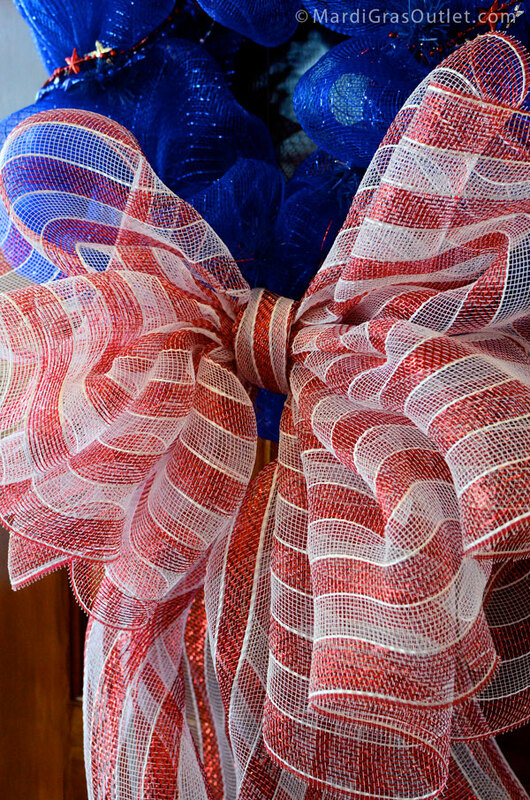 Poly Deco Mesh sometimes called Geo mesh is a type of soft plastic art netting that is perfect for making wreath, bows and more. It is durable and holds its full shape indoors and out. 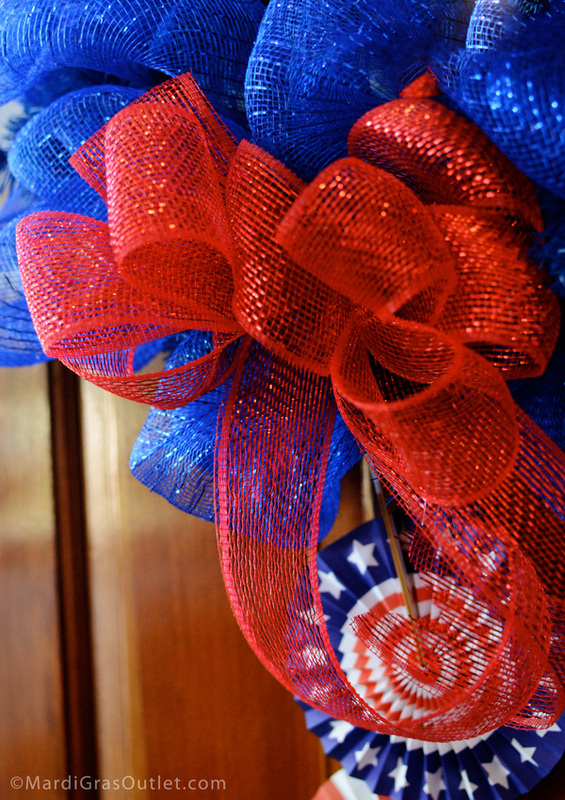 Mesh come in many colors, allowing you to customize your decorations for any season or celebration. 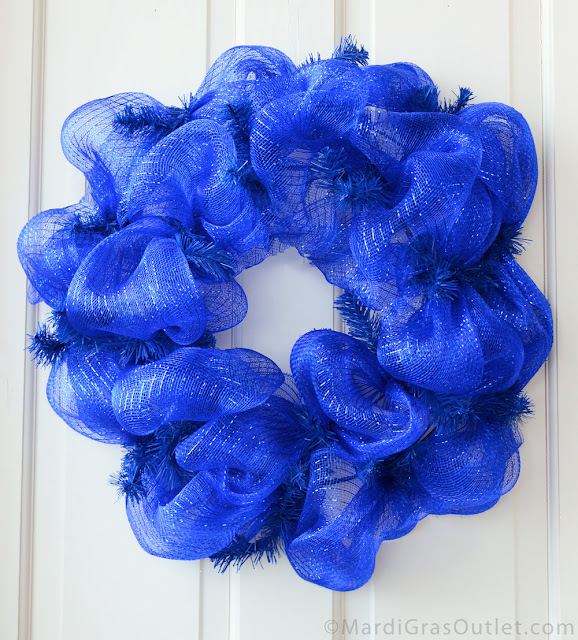 Using mesh and a simple work wreath form you can easily create the base for any type of seasonal wreath. 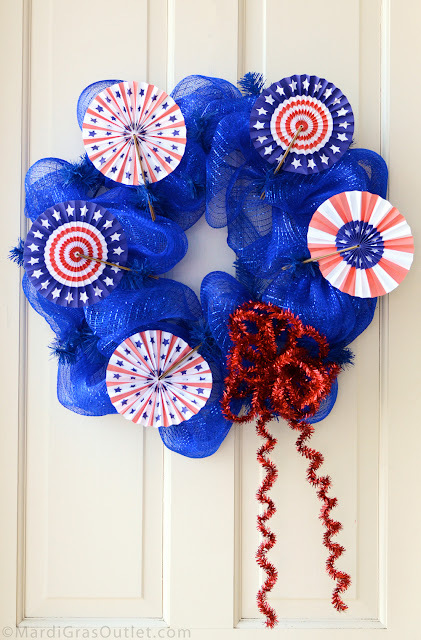 Here is a basic tutorial for creating the base wreath with a work wreath form. To purchase these products from www.mardigrasoutlet.com, click on the individual product links above or click HERE for a page listing of all products. Time/Cost: This wreath is simple and quick to make, one hour or less to put together. 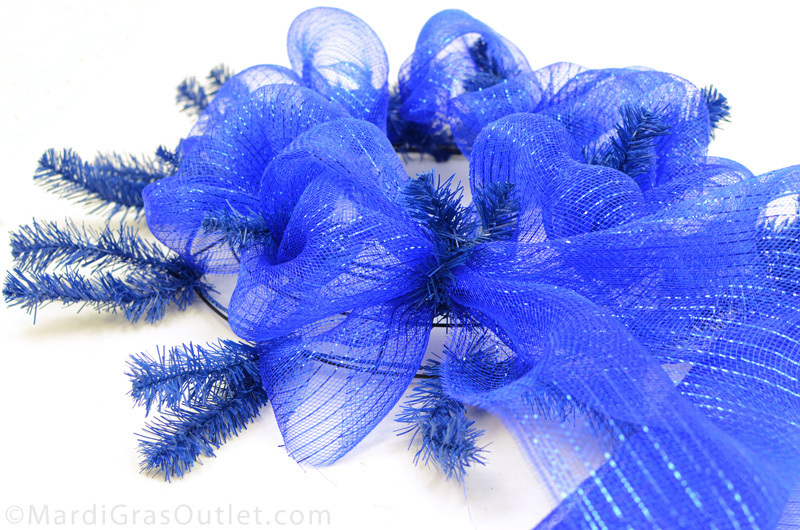 The total cost of the basic supplies for the blue mesh wreath is about $15. 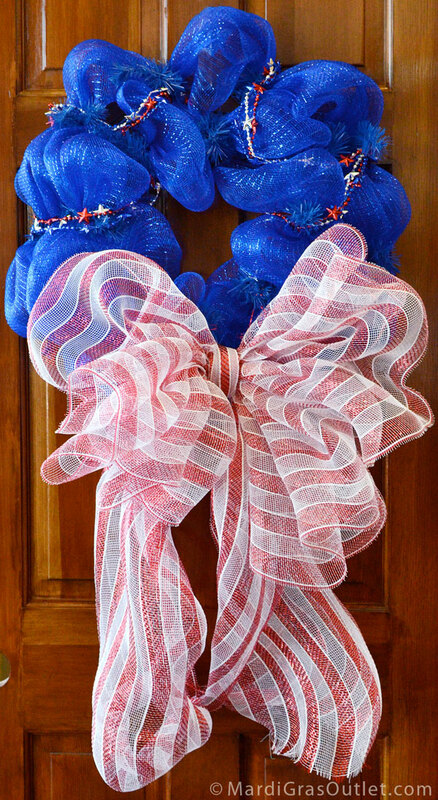 Depending on what accents and bow you choose, your total cost for the decorated wreath can range from $17 to $36. A great bargain! First, open up the tinsel ties so you can easily place the mesh in between each pair. Bunch the end of the mesh and secure into a set of ties on the inner ring. Twist the wire ties around the bunch to secure. Now you will form a puff. Move down the mesh about 9" in length. Working from each side as shown, fold as you gather the deco mesh into the center. This creates an even, fuller looking puff. 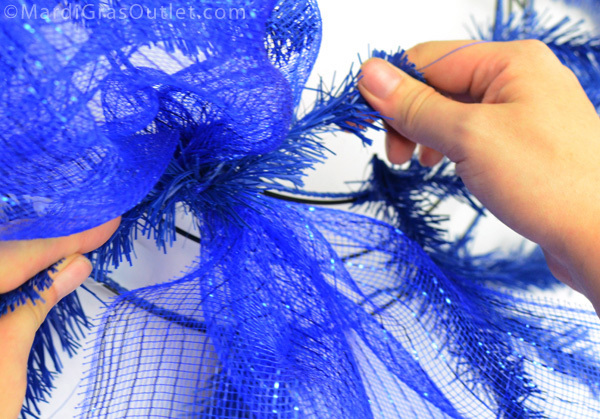 To secure the puff, place the gathered section into the next set of tinsel ties on the inner ring. Twist the ties several times to secure the deco mesh. Pull and fluff the deco mesh puffs out as you go. 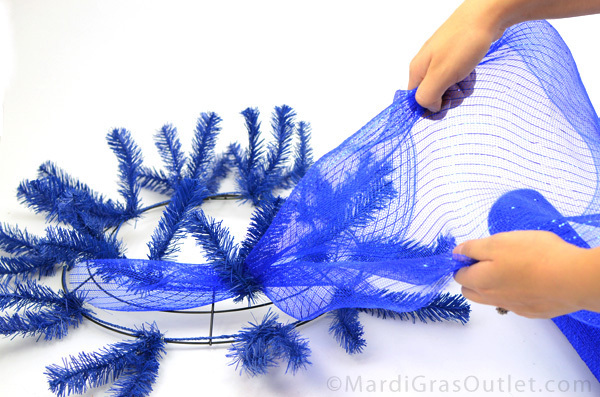 Continue around the entire inner ring, gathering, attaching and fluffing the mesh puffs. There is no need to cut the mesh between the puffs. 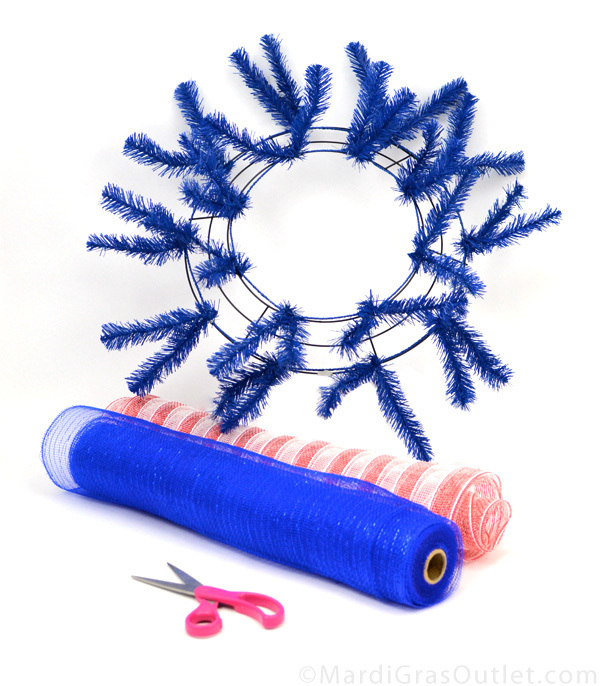 Once you have filled in the inner ring, move down to the outer ring without trimming the mesh. Fill in the entire outer ring with puffs, just like the inner ring. 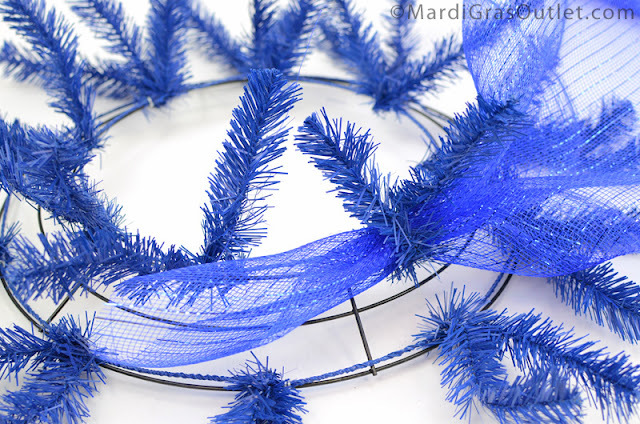 Once the outer ring of the wreath is filled in, trim the excess deco mesh. 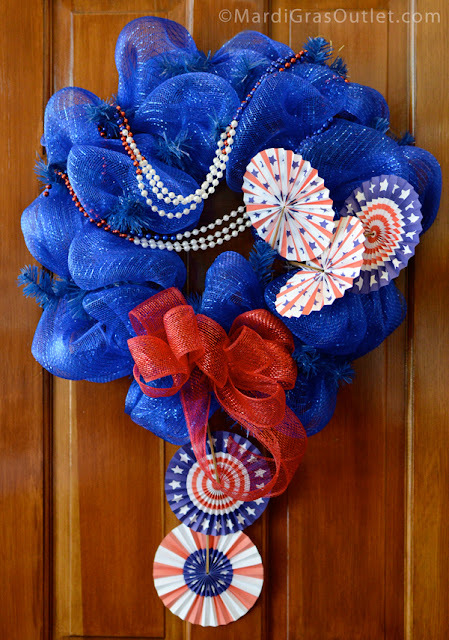 This wreath form uses the most part of a 10 yard roll of the deco mesh. 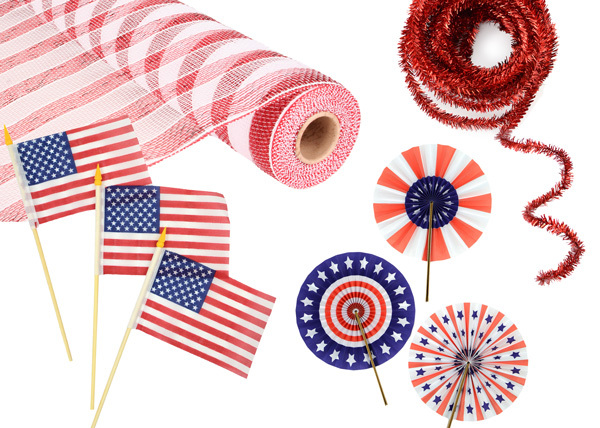 Choose your preferred patriotic accents and bows. 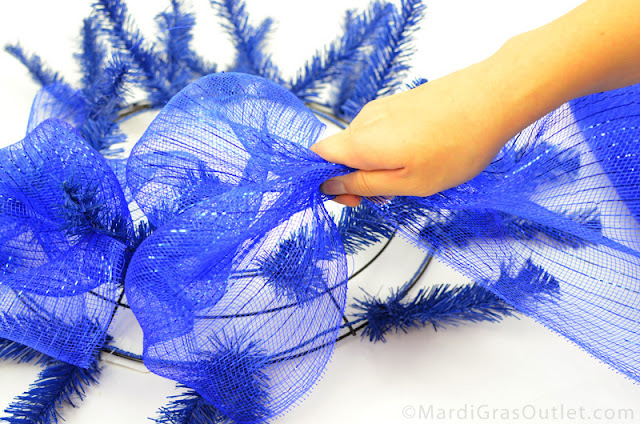 Add them to the basic wreath by securing them into the tinsel wire ties. 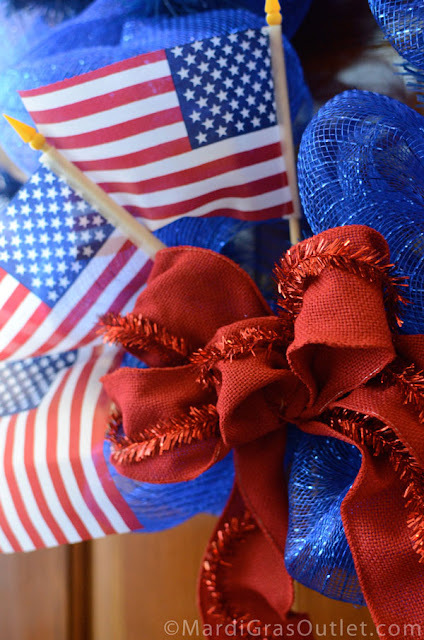 Here are some suggestions to inspire you. 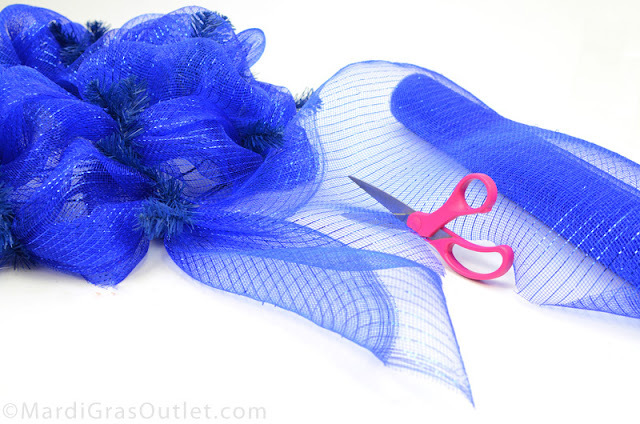 Making a Large Bow with Deco Mesh. 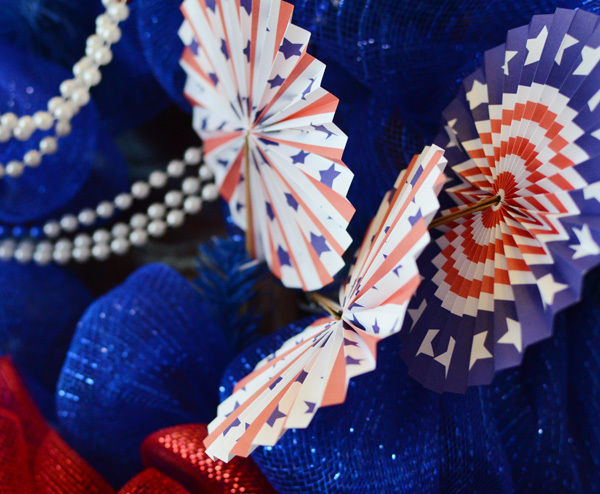 We hope you have a fun filled Fourth of July!